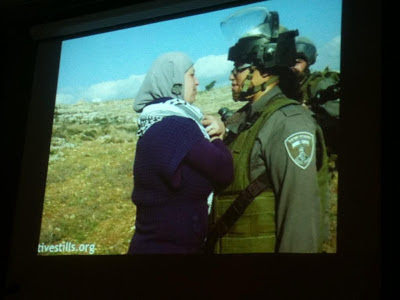 While Gaza is under attack by the Israeli forces, I was attending the Settler Watch organization's seminar on "Cameras As Weapon" where visiting Palestinian photojournalist, Bilal al-Tamimi was speaking about the atrocities done by the settlers and the Israeli government against the people of Palestine. It's just heartbreaking. The Israeli occupation has truly surpassed all the ways of violating Human Rights, and the world is just standing watching and doing nothing. Even today's attack is just an extension of their atrocity. So tragic! Here is al-Tamimi's wife facing an Israeli solider defending herself. The picture is taken by al-Tamimi.